Still new enough to remember what the new breeder needs, but experienced enough to offer expert advice. Owned and operated by Graham Lugg and Tim Toshack in the fine wool growing area of the Southern Region of New South Wales, just north of Yass, and very close to the Hume Highway. Lualto has a number of top sires producing quality progeny for inspection. The majority of our herd is white and light fawn, however, we also have a number of top quality, brown, medium/dark fawn and some black animals. We hope you enjoy browsing through our site at our top quality sires and some of the animals we have ‘for sale’, and our recent experiences on the news and events page. 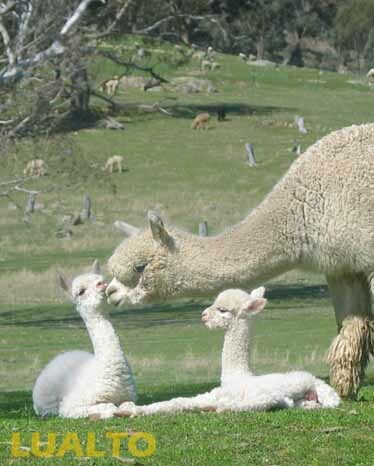 If you require any further information or advice or just want to talk alpacas please don’t hesitate to contact us.